This was the best date ever with my beloved birthday celebrant, Sheff. We had dinner at Vikings in SM Lanang Premiere. The place is huge and well, it's the buffet for big eats. I personally love the ambiance inside despite the crowd and busy staff, we did not feel like we were just there to eat but it felt like we were there to cherish the moment, his 26th birthday. The staff were accommodating, they gave us detailed information and polite to take our dishes out so we won't have to use the same dish for the next round. Inside was also safe, I left my jacket and my bag on our table (except for my camera and wallet of course lol) cause I think people are there to have a good time and good food. There are a variety of food that you can choose from: Filipino, Japanese, Chinese, Korean, Italian, American, European and maybe other cuisines that I didn't know. We went over to the first counter on the left, little by little tasting and eating their food until we reached the right counter and next to the center which was dessert. All of their food were appetizing, delicious, new, and fresh. It's a buffet to celebrate special occasions and worth the price! We were also surprised by a group of boys, entertainers who performed a magic trick and sang the happy birthday song while they lit the candle of Sheff's complimentary birthday cake. It was hilarious and flattering at the same time. I thanked them so much for treating his birthday with a funny entertainment that was priceless, laughter is indeed priceless. This was on my plate. I had black Italian thin crust pizza, something like a pastry sweet pizza, corn dog, paella, lasagna, chicken barbecue and thai pork barbecue. I think it's kind of heavy for an appetizer but I got too excited to care about appetizers haha. The first pizza was sweet - it seems like the dough made it sweet. The black pizza was absolutely yummy - I loved that it's black but the flavor is the same with a pizza dough. The corn dog was nothing special but it brings back childhood memories. The paella was lovely - delicious, sweet like basmati rice, absolutely perfect!. The Lasagna was very good too, and both of the barbecue were awesome! I liked the thai pork - it's full of lean meat and not fatty. The next round I had lechon rice, lamb stew, baby back ribs, chuck eye steak, and bacon wrapped (sorta like ham). Lechon rice was okay - I liked the paella more, I was just curious I wanted to try it. Lamb stew was perfect - soft meat melts in your mouth, sweet and savory. Baby back rib was awesome too. The bacon wrapped sorta like ham was okay - maybe because I didn't like the flavor that much. The chuck eye steak was beautiful (medium rare) - although I ate too much lamb and I couldn't enjoy the steak anymore lol so I gave my second slice to Sheff. For the 3rd round, I wanted to eat something Asian haha. I had 4 types of sushi, fish ball I guess, chicken teriyaki and I forgot what the other one's called - it had caviar on top of it. Their sushi was delicious, except for the salmon, or maybe if only I drizzled a lil' wasabi and soy sauce on top it would have been magical. The fish balls were okay (I didn't know I had to dip it on the sauce first lol). Chicken teriyaki was terrific, and that taco thingy was kind of sweet and spicy, taste like taco but I am absolutely sure it's asian. And for the finale, dessert!!! Me and Sheff decided to take each other's plate with different flavors so that we can just share every one of them and we won't have to feel like blowing up. On our first plate we had carrot cake, mango creme brulee-like (I forgot sorry), mocha tiramisu, ube, cream puff and pudding. Carrot cake was just okay - we didn't liked it very much. That mango creme brulee-like was very creamy and mangotastic hehehe. Ube is our favorite Filipino treat and this one just nailed it! Ube delicioso. The cream puff was so good - If only! if only I could eat more lol. Mocha tiramisu was our favorite in the bunch - It taste like coffee, a lil' bit of bitterness and sweetness which was a perfect combination. The pudding was also great! I would have devoured another one. On our 2nd plate we had cake (which I forgot the flavor), coffee jelly, creme brulee and chocolate rice crisp. The cake was okay - just your typical cake. Coffee jelly was superb! a new twist for coffee. The creme brulee was meh... okay, taste like real egg yolk, I guess they changed the style of the original creme brulee?. The rice crisp was very good although I didn't get to taste it because Sheff immediately ate it without saying a word. It was good, taste like vanilla and the chiffon was soft and not too sweet. A finishing dessert that we enjoyed. Everyone also had fun watching the boys who were entertaining us with their quirky and cute acts! Furthermore, I would recommend this to everyone who wants to have a taste of everything from food, entertainment and comfort. Birthday celebrants are highly recommended to have their occasion here because the celebrant is free of charge. We only paid my fee which was around 800 php. It's surprising because this restaurant is world class - food, staff and the whole place yet they gave us a wonderful feeling like a "Barkada" feeling, and a very friendly price. Everyone should try the food in Vikings! taste it to believe it. Vikings is located at SM Lanang Premiere, near the fountain area. hah! it was surprising of me to have French Baker's Blue Cheese Burger while my boyfriend had the usual Whole Wheat Tuna. I wanted something new, and I wouldn't want to call it "cheat meal" because it was too darn good. I should prolly be honest that I haven't had burger in a year now because of my diet and exercise. Burger for me, as a woman, means "bulking" and I'm like 5'2" in height. Appalling as it may sound, I got fed up with my "over-strict-diet-routine" and it's making me go mad thinking about damn delicious food. Sheff indeed is strict on my diet and wants me to accomplish my goals, I have no regrets tho but sometimes you have to make your soul happy, once in awhile. Furthermore, we had black tea. It was one hot sunday and this was just refreshing, as always. I love that crackling sound haha. Italian Almond Black Tea how could I ever say NO to tea! not overpowering, especially the soft and amazing bread. Magnifico! French Baker is located at SM Lanang Premiere, near the fountain area. First of all, I am a Hannibal the Cannibal fan. J'adore Hannibal Lecter, swirling in my mind like the intestines of a pig piled in the tub. Enchanted by his ridiculously gentle manners, evil schemes and blue eyes, not dead but subtle. This is not about Dr. Hannibal. I want to share my delightful experience in French Baker, SM Lanang. Me and Sheff didn't appreciate French Baker once because we only see pastries, chocolates, and rich people dining (lol). I mean, judging the food without even tasting it. Then yesterday we decided to try the newly opened French Baker establishment in SM Lanang. The place was beautifully decorated with leaves wallpaper (or vines), warm colors - brown, ochre, orange, green and white, and a Parisian touch. I loved their tables and chairs, very comfortable and the staff were welcoming! I gotta say, It is not just a place for the wealthy, but a place for family and friends, hang out, have a cup of tea, talk or perhaps read a book. We are into Health and Wellness therefore we are not picky but aware of what we eat. We ordered their Whole wheat Tuna sandwich, two pieces of macaron, and tea. It wasn't a "cheat day" also, instead we should call it a date night (with macaron in moderation). It was my first time to eat macaron, and so I was pleased. Furthermore, French Baker has the best tea in town! I guess I haven't tried others yet, but honestly the green tea was heaven! I would like to try Black Forest tea when it will be available next time. First time to have macarons, THE BEST! all caps! Me and my boyfriend had the same order. Whole wheat tuna sandwich, with salad (which was superb! ), and potato chips (I had a few and they were tasty). We had Moroccan Mint Green Tea. We didn't even need to use sugar because it compliments with the macarons. The aroma of the mint tea was fantastic. French Baker is located in SM Lanang, near the fountain area. Bon appetit! Pumpkin is chock full ‘o goodness. You can tell by its bright color that it’s going to be going to be good for you. Not only is pumpkin loaded with vitamin A and antioxidant carotenoids, particularly alpha and beta-carotenes, it’s a good source of vitamins C, K, and E, and lots of minerals, including magnesium, potassium, and iron. - Cut all the ingredients into cubes. - Pour in Water along with salt and pepper. - Boil it. Medium heat... boil until ingredients are breaking apart or soft (for puree). 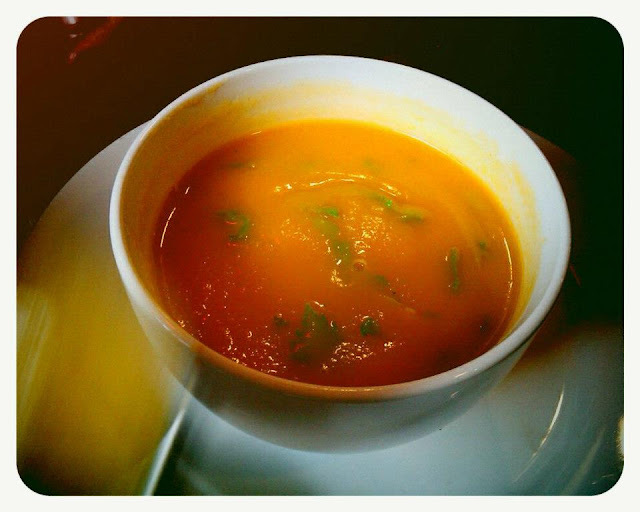 I actually had the best pumpkin soup ever at Baguio City, Philippines. It was an all-vegetable restaurant called Azotea Greens. They serve the best veggie meals in town (for us hehe). The whole idea was to make fried chicken LESS in calories and more on protein and other nutrients. Cooked Pan fried so it's not as greasy as finger lickin good but c'mon it's your choice. If you like deep frying them... I think you will regret the taste. If you have like a bigger pan, it makes cooking faster but if you're using the smaller pan, at least 3 pieces of chicken will be fine. after cooking the 3 pieces (like a golden brown color), scrape off bits and pieces of torn breading or at least use another clean oil. That way, the next batch won't get burned. Keep in mind, the whole wheat and desiccated coconut can easily charred so you have to be cautious on time. - First, prepare the chicken breasts on a plate. - Second, prepare the beaten eggs on a plate/bowl. - Third, prepare the whole wheat and desiccated coconut. mixed properly with salt and pepper on a bowl/plate. - Fourth, prepare tissue paper (for fried food) on a plate/strainer. This is still not cooked though but it should look like this. Overcooking it means it has too many charred parts which also means chicken isn't juicy and burnt food is cancerous. - After cooking the first batch of fried chicken, place it on the tissue paper to remove excess oil. - Next, scrape off bits and pieces of the breading, or just clean the whole pan but don't wash it off with water. just scrape it off. - Pour palm oil again, and not too much. medium low heat. - Cook the rest of the 2nd batch. - Repeat process for your desired number of serving. - It's either you use pure parsley leaves, or basil. I like mine with red rice and ketchup as sauce. This dish is excellent with family and friends. The warm colors of yellow and beige bring out the comfort in food and at home. This is a traditional Filipino dish. The taste is usually sweet and welcoming. It is mostly served in family gatherings, fiestas, birthdays, Christmas and some Festivals. First, roughly chop the 3 cloves of garlic, next side-slices of white onion. Second, heat the pan in medium heat. Then, pour the 3 tablespoon of oil on the pan. Next, saute roughly chopped garlic, saute for half a minute (don't leave it too brown). Thirdly, Stir-fry chicken with garlic. When chicken breasts are cooked well (don't overcook it), Saute the onion and pineapple for 1 minute. Lastly, add half can of coconut milk and saute. Add salt, pepper and coconut sugar (brown sugar) to taste. Set the stove in low heat, leave it covered and wait until the sauce thickens (don't forget to taste). chop the garlic and onion to small pieces. Then slice the sweet potatoes to your preferred shape and size. Rinse the beansprout on a strainer. add the sweet potatoes then stir-fry. When sweet potatoes softens. Add the beansprout (with mixed vegetables). stir. Wait until beansprout becomes translucent. Then pour oyster sauce. stir. Set fire into low heat. then wait until it becomes a bit thick and saucey. Instead of stir-fried noodles, beansprout has the same texture as of the noodles and more healthier. Enjoy!